Before we fully dive into the holidays and shopping and all that, let’s take a few minutes to step back and decide what we can do to give back to the city we love. Please consider donating your cash, time, or skills to one of the organizations listed here. They’re all Memphis non-profits that could benefit from your generosity this holiday season and year round. This list is by no means complete – there are hundreds of incredible organizations in this city that are worthy of your love. If there are any organizations you work with or support that aren’t on the list, please leave them in the comments with some details on what they need so that everyone can see them. What they do: BGCGM provides academic, recreational, and mentoring programs for young people in need in Memphis. Read more on my post here. How you can help: Sponsor a child or scholarship a student, make a one time donation, or attend the annual Toy Bash. What they do: BRIDGES works to inspire diverse young people to become confident leaders through camps and programs like Bridge Builders, internships, team building programs, and education. How you can help: Make a financial donation or email BRIDGES to inquire about volunteer opportunities. What they do: Camp Good Times is a weeklong sleepover summer camp at Shelby Forest for kids and adults with mental disabilities who may not be able to attend a traditional summer camp. How you can help: Volunteer to be a camp counselor, camp nurse, or make a financial donation here. What they do: The Child Advocacy Center provides services to some of Memphis’ most vulnerable, the victims of child abuse, that help them recover from abuse and return to normal childhoods. They provide counseling, prevention services and advocates to children and families in need. How you can help: Make a financial contribution to the CAC, or volunteer to serve as an ambassador, help around the CAC office or work at special events. What they do: The Church Health Center provides medical, vision and dental care to Memphians who have jobs, but lack health insurance. They also run the Church Health Center Wellness, a pay-what-you-can fitness and community center (pictured above). How you can help: Volunteer to help out at the clinic or Hope and Healing center (or be an on-call volunteer for whatever’s needed most). You can also make monetary donations or donate items from the CHC’s wishlist. What they do: Creative Aging improves quality of life for Mid-South seniors by providing them access to the arts where they live and gather. How you can help: You can donate or volunteer as an Entertainment Host or help out at annual events liek Game Day, Senior Variety Show, Artist Showcase and Silent Auction. What they do: The DeNeuville Center’s mission is to educate women of all backgrounds, both in school subjects (like English, art, reading math and GED classes) and practical skills (like budgeting and parenting). How you can help: The center can always benefit from monetary donations, but they’re also in need of volunteers to babysit, tutor the center’s clients in ESL, GED prep and preparing for the U.S. Citizenship test. They also need people to help maintain the building and answer the phones. What they do: The Dorothy Day House of Hospitality is the only shelter in Memphis that allows families to stay together. They provide food, shelter and clothing to homeless families, then works to get them back on their feet, even after they’ve returned to permanent housing. How to help: The house is always in need of donated supplies (here’s a full list), monetary donations and volunteers to provide childcare, work on the house, tutor, prepare meals and more. What they do: Imagine finally landing a big job interview, but not being able to afford an outfit that will allow you to dress to impress. Dress for Success provides professional clothing, job mentoring and career services to women in need. How you can help: Donate a new or gently used (clean) suit or business casual clothing or shoes to their closet. What they do: Friends For Life helps Memphis-area people infected and affected by HIV/AIDS to live well. They provide free HIV testing, prevention services, education, housing, a food pantry, pharmacy, mentoring and support, transportation and emergency financial assistance. How you can help: Make a financial donation or volunteer as a Spanish language translator, food pantry attendant or meal prepper, or for other projects. How you can help: Donate to help GrowMemphis fund new gardens or find out volunteer opportunities. What they do: Habitat for Hope provides housing and support for families facing as serious illness of a child. They have housing and facilities in Shelby Forest as well as two furnished apartments in downtown Memphis. How you can help: Volunteer for administrative, support, or housekeeping duties, donate financially, or donate some items from the wish list. What they do: The Halal food pantry at Masjid Al-Mu’minun is the first food pantry in Memphis to provide strictly Halal food to Memphians in need. How you can help: Call (901) 789-1904 or visit the food pantry’s Facebook page for details on helping out. What they do: H.O.P.E. is a Mid-South Peace and Justice Center-sponsored organization that advocates for and provides resources people who are currently or have formerly experienced homelessness. How you can help: Donate gently used or new winter clothes, sleeping bags, and blankets at the MSPJC (3573 Southern Ave.) during business hours, donate to the H.O.P.E. Women’s Caucus’ fund for self-defense classes (they are hoping for $800 this month) by calling (901) 725-4990 during business hours, make a one-time financial contribution or the MSPJC easily online, or become a member of the Mid-South Peace and Justice Center. What they do: The Hope House works with families impacted by HIV/AIDS. They’re the only organization in Tennessee that provides preschool and family-centerd care to severely impovershed families affected by HIV/AIDS. How you can help: Volunteer as a classroom or aftercare helper, make a financial contribution or donate items from the Hope House wish list. What they do: The Humane Society provides shelter, medical care and adoptions to injured and abused dogs and cats. How you can help: Adopt one of the Society’s adorable dogs or cats (some of them, who have been there the longest, have free adoption) or volunteer to walk dogs, keep kennels clean, or foster an animal. What they do: LMS estimates that there are more than 120,000 Memphians who can’t read well enough to apply for a job. They work to improve the literacy rate in Memphis by providing literacy classes to all ages and skill levels, professional development help and one-on-one tutoring. How you can help: Donate your time to tutor one of LMS’s students or work in the office. Or, donate money to help the Council continue its programs. What they do: The MCIL is an integrated community that equally welcomes all members, and advocates for and supports people with disabilities so they may live independently. How you can help: Donate to the Memphis Center for Independent Living online. What they do: The MGLCC provides a safe, welcoming space for Memphis’ gay, lesbian, bi and transgendered community. They provide free HIV testing, support groups, counseling referral, and support to LBTQ youth in need of support and care. How you can help: The center always needs volunteers to answer phones, be ambassadors or serve on committees. You can also make a financial contribution. What they do: The MOSD focuses on developing listening and spoken language skills for thousands of children with hearing loss. How you can help: Donate, volunteer for fundraisers, or purchase holiday cards from the MOSD’s website. What they do: The Food Bank fights hunger in the Memphis area by providing food, basic necessities and nutritional education to those in need. They serve 30 counties (not just the city of Memphis) and offer over a thousand meals every weekend to school kids. How you can help: Financial donations go a really long way because the Mid-South Food Bank can buy food in bulk from manufacturers (see warehouse photo above – that’s just a tiny part of the facility). You can also organize a food drive (or contribute to one) or volunteer. If you feel like you won’t make a difference, know that just one dollar can provide two meals to someone in need. How you can help: Make a financial donation, or volunteer for clinic assistance or special events. What they do: MIFA (Metropolitan Inter-Faith Association) works directly with some of Memphis’ most vulnerable senior citizens and families. They provide Meals on Wheels, companionship and handyman services to seniors, provide emergency housing to families in crisis, help find homeless families permanent homes and provide mentoring and college prep help to teens. How you can help: You can donate cash to MIFA or volunteer as a college mentor, Meals on Wheels deliver-er, senior ombudsman or be a senior companion. What they do: The OPC is in charge of 184 acres of public parkland, including the Old Forest State Natural area, Rainbow Lake, Veteran’s Plaza, the Greensward, and more. How you can help: Volunteer your time, become a member, or make a donation. What they do: Porter-Leath works primarily with children and families. They provide Head Start preschool, parenting classes, foster grandparents, foster care and a shelter for runaway youth. How you can help: Donate a new, unwrapped toy to the Toy Truck. You can also fulfill a holiday wishlist for a Porter-Leath kid, make a financial contribution, or volunteer. What they do: Project Green Fork contributes to a sustainable Mid-South by helping reduce environtmal impacts, with a focus on strengthening homegrown restaurants. PGR has a certification system for restaurants so diners can choose to support eateries that are committed to Project Green Fork’s mission. How you can help: Choose to dine at Project Green Fork restaurants (list is here), make a donation, contact PGF for volunteer opportunies, and encourage your favorite restaurants to get certified if they aren’t already. What they do: The Ronald McDonald House provides a comfortable home away from home to non-local St. Jude patients and their families while they’re receiving care at the hospital, free of charge. How you can help: Donate some items on the house’s wish list, take up a pop tab collection or become a House Hero. What they do: Room at the Inn is a Memphis network of churches that provide shelter, food, and amenities to people experiencing homelessness during the coldest months of the year (Nov. 1 – March 31). Their philosphy is that no one should sleep in the cold while churches are warm and empty each evening. They are also working to open a facility, the Carpenter’s House, in downtown Memphis. How you can help: You can donate to the Carpenter’s House fund, donate money or buy some of the items on the wish list, or sign up your congregation to be a part of the Room at the Inn network. What they do: SRVS provides job training, jobs, eductaion, clinics, housing, and a supportive community for Memphians with developmental disabilities. They also provide support to the families of the people they serve. How you can help: If you’re a warm, friendly person who likes to smile a lot (because you will smile a lot), volunteer to work with SRVS. They’ve got all kinds of hands-on opportunities, most of which come with the instant gratification of knowing that you’ve made someone’s day better. What they do: The St. Vincent DePaul soup kitchen is open seven days a week, 365 days a year to provide a warm meal and gathering space for Memphis’ homeless and hungry. On a normal day, the mission serves 150 – 225 people. How you can help: The mission needs volunteers to prepare and serve meals. They also need donations of food, cash and supplies. To volunteer, email danieldjl@aol.com. What they do: The Streetdog Foundation rescues, rehabilitates, and re-homes stray and abandoned dogs in Memphis. They are not a shelter, so they rely on volunteers, foster dog owners, and donations. How you can help: You can adopt a dog (I’m a supporter of “adopt don’t shop!”), foster a dog, volunteer, or donate. What they do: At 4,500 acres, Shelby Farms is one of the largest public parks in the United States with trails, a Greenline, horseback riding, lakes, playgrounds, disc golf courses and a home for a herd of buffalo. 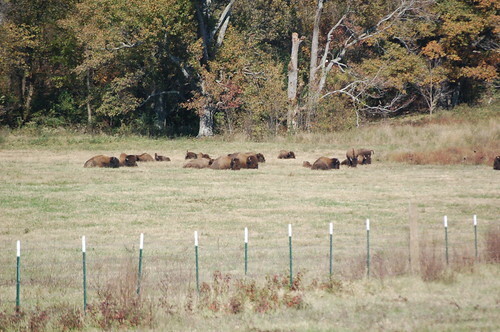 How you can help: Shelby Farms can always use monetary donations, but the most fun way to do it is through the Adopt a Buffalo program. You can also volunteer for one-time and long-term service projects in the park. What they do: Volunteer Mid-South provides a network of non-profits, businesses, and volunteers to help volunteers connect with organizations and help companies create volunteer programs. What they do: Volunteer Odyssey matches volunteers with opportunities in the Memphis area. They also run a Job Seekers program (volunteer for a week while you’re in between jobs), a Corporate Teams program (for companies that want to do group volunteer projects), and VolunCheers events. How you can help: Volunteer Odyssey needs monetary donations which you can easily do here. You can also sign up for one of the programs listed above if you’re a good fit, or check out the volunteer opportunities calendar if you have a few hours here and there to volunteer in town. How you can help: Make a financial donation, volunteer your time, or become a member. What they do: Women of Hope is an international, Memphis-based organization that provides training, education, and support for women with disabilities living in Sierra Leone. As a response to the recent Ebola crisis in Sierra Leone, WoH has also taken on the task of providing emergency food and basic needs. How you can help: You can make a financial donation to one of the specific programs that WoH sponsors, you can donate directly the the “Disabling the Power of Ebola” fund, or volunteer for special events. What they do: Youth Villages provide kids and teens in Memphis with crisis services, foster care and adoption, housing, mentoring, transitional living and in-home services. How you can help: You can volunteer in a number of positions, make financial contributions, or attend the annual Soup Sunday event. Like I said, these are only a few of the many, many local organizations that are worthy of your time and contributions this holiday season. If you know of or are involved in others, please leave them in the comments so that everyone can see them. Be sure to mention what the organization does and how people can best help them. Do you have suggestions for some drop-in volunteer opportunities; specifically ones that happen frequently & don't require an application process? What they do: The Alzheimer’s Association Mid-South Chapter is a voluntary health organization dedicated to care support, research and advocacy for those affected by Alzheimer’s disease. We are supported by the community and individuals like you. We offer a 24/7 help line – (800) 272.3900; facilitated support groups; care consultations; referall program (nursing homes, assisted living facilities, physicians, elder law attorneys, etc. ); advocacy; and more. Thank you for this fabulous list! PS – I love the cover photo! What they do: Lifeblood is the Memphis region’s only non-profit volunteer blood center. Lifeblood is the leading provider of blood and blood components to area hospitals, supplying more than 100,000 units for local patient transfusions each year. Through its neighborhood donor centers and full schedule of mobile blood drives that come to business, schools, and places of worship, Lifeblood provides opportunities to donate blood year round. In 2013, Lifeblood celebrated 50 years of service and 4 million lives impacted by volunteer donors in the community. How you can help: There is no substitute for human blood and you can save up to 3 lives by donating 1 pint of blood. It can be done on a lunch break, after work, on the weekend and is a unique way to give back to the Mid-South. For more information or to schedule an appointment, visit http://www.lifeblood.org or call 1-888-LIFEBLOOD. http://www.bgcm.org the Boys & Girls Clubs of Greater Memphis does so much for the children in the community! everyone should stop by visit and make donations if possible! The mission of the Boys & Girls Club is "To enable all young people, especially those who need us most, to reach their full potential as productive, caring, responsible citizens." Through a variety of academic and recreational programs, BGCM empowers members to make productive use of their time and wise decisions in their lives. It’s how we’re opening doors for Memphis kids every day, at the positive place for kids. WAYS TO GIVE ONLINE Sponsor a Child – Set up a monthly donation that will be matched dollar-for-dollar doubling your impact! Scholarship a Student – Giving $100 or more a month will scholarship a student to the Juice Plus+ Technical Training Center. All monthly gifts are matched! One-time Gift – A simple one-time gift can mean a lot to a child. Give in honor or memory of someone – Gifts are acknowledge to the person or family you choose. Send a child to Camp Phoenix – $250 scholarships a member to a week at Camp Phoenix! Capital Campaign – Invest in the future of the Boys & Girls Clubs and help us expand and enrich services for our members. MTR Give is an opportunity for family, friends, and the community to directly impact the classrooms of Memphis Teacher Residency teachers. Graduates post project requests and donors are able to donate to specific projects. Maxx’s Happy Child is a 501c3 Nonprofit committed to promoting physical activity,healthy living & resources to promote academic excellence in our youth. I will compile the 2016 volunteering guide in early November 2016. Feel free to email me at hollywhitfield@memphistravel.com at that time!